When it comes to scuba diving equipment, you will want everything to be comfortable and help you whilst under the water. Scuba fins are one of the most important components of your gear because they help propel you through the water. The best scuba fins are the Mares Avanti Quattro Plus, which uses clever channel water channeling technology for maximum thrust underwater. If you have ever hired scuba diving gear, you will always find that the fins are usually uncomfortable and leave you with sore feet. However, investing into your very own scuba diving fins will ensure maximum comfort. 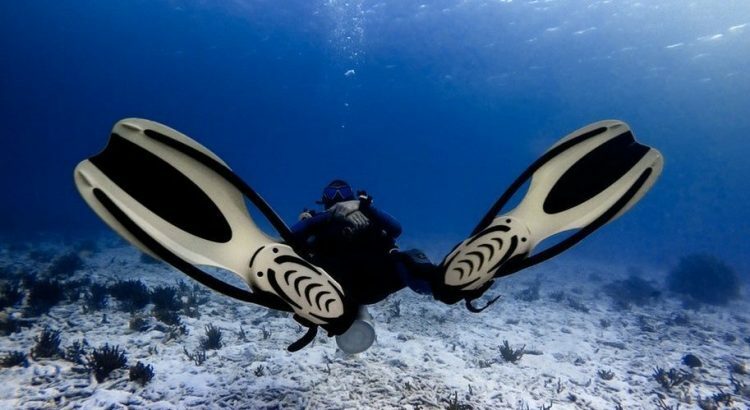 As technology has improved, so have scuba diving fins with many using special channeling technology for maximum thrust. 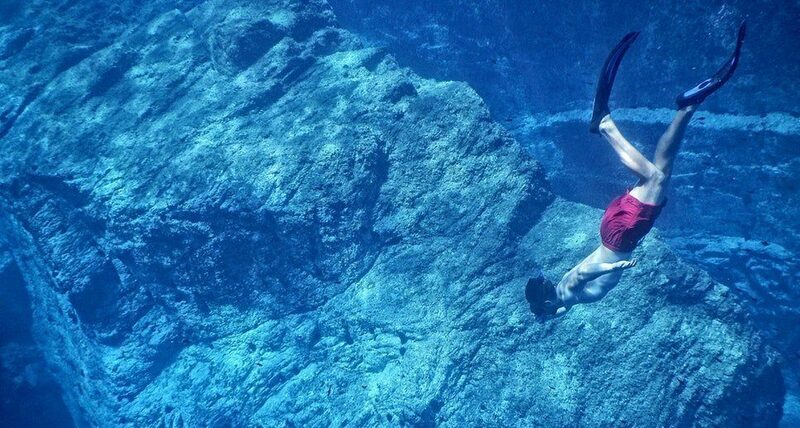 Even if you are not the strongest of swimmers, the technology will allow you to power through the water no matter how hard or soft that you kick underwater. Buying scuba diving equipment can be expensive but we have found many that are suited to a range of budgets. Below is a list of the best scuba fins that will help propel you through the water and are comfortable to wear for long periods of time. The Mares Avanti Quattro Plus are very comfortable scuba fins with an excellent fit. They’re designed to boost your power in the water and help you move efficiently. The fit of the fins is also very easy to adjust, and they’re quick to get on and off. Here are some of the notable features of the Mares Avanti Quattro Plus. These scuba fins are very flexible and conform to your foot for incredible comfort while you are out on the water. They channel water away and are designed to minimize fatigue during long dives. Overall, the Mares Avanti Quattro Plus is a great buy for the avid scuba diver and will not leave you disappointed. The Scubapro Seawing Nova fins are designed for the experienced scuba diver that wants to fly through the water with ease. Every aspect of these fins is designed to make diving easier and improve your thrust in the water. One unique aspect of these fins is an articulated joint that allows the blade to pivot for even more direct power. Below are the notable features of the Scubapro Seawing Nova fins. In addition to being very powerful, the Seawing Nova fins are also very stable on your foot. The extended heel plate adds comfort, reduces strain, and keeps the fins in place, while the bungee heel strap is easy to adjust, as well as take on and off. Finally, the arced wing tips keep the fins stable, even when you’re moving fast. High-speed scuba divers can’t go wrong with the Seawing Nova but you will have to pay the expensive price tag to buy them. The Sherwood Triton fins are a tried and tested that experienced scuba divers love. They have the classic scuba fin appearance, but they also have all the features you need to keep moving quickly in the water. This can be seen by the vents that are appropriately placed to prevent drag and increase thrust in the water. Here are some of the notable features of the Sherwood Triton fins. These fins are very aerodynamic, and they are also very easy to get on and off. You can easily adjust the straps, and you can pull the fins off in just one motion. The Sherwood Triton fins are a classic choice for scuba divers that provide the aerodynamics you need to move powerfully in the water. Cressi is an Italian scuba diving brand that has been making incredible gear for over 70 years. We are big fans of their quality scuba mask and snorkeling gear but their scuba diving fins are just as great and offer excellent value for money. Here are some of the notable features of the Cressi Open Heel scuba diving fins. If you are looking for a diving fin with an open heel and flexible design, this is an excellent choice. The Cressi open heel scuba diving fins and comfortable and move efficiently with you in the water. They are great for both beginners and experienced users and offer excellent value for money. The TUSA SF-22 Solla fins are another good choice for anyone who is looking for an open heel fin. Their unique design is powerful, efficient and comfortable with many features that propel you forward in the water with minimal effort. They are also very aesthetically pleasing and sleek, perfect for the diver that wants to be stylish in the water. Here are some of the notable features of the TUSA SF-22 Solla open heel scuba diving fins. The SF-22 Solla fins are truly designed for performance with an aerodynamic design that cuts through water. Although these fins are very powerful, they are also easy to maneuver in the water. Additionally, they have a durable construction that uses patented technology and high quality materials to withstand years of scuba diving. 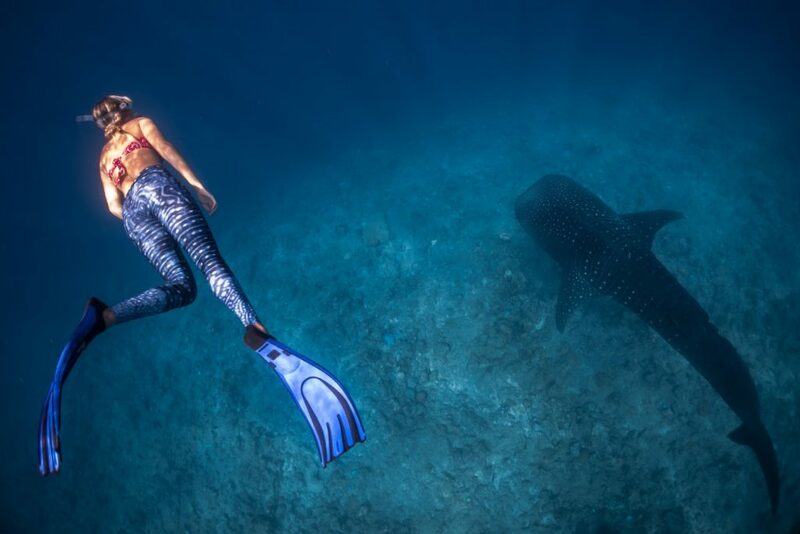 Your fins are one of your most important accessories when you are diving, and it’s worth investing in a pair that are not only comfortable, but will boost your power when you are underwater. If you’re buying fins for the first time, it can be difficult to figure out which features are most important to the overall efficacy of your scuba fins. Here’s everything you need to know about shopping for scuba fins. The first thing you will need to decide when shopping for scuba diving fins is whether you want a full foot fin or an open heel fin. Both of these designs can be very effective in the water, it just comes down to personal preference. Full foot fins can be worn barefoot, and they are typically better for warm water diving. Open heel fins need to be worn with neoprene booties and are better for cold water diving. In general, serious divers tend to prefer open heel fins because they tend to be larger and more powerful than full foot fins. However, every model is different, and ultimately it’s up to you to decide which is going to be most effective. You will also need to decide whether you want split or paddle fins. Paddle fins are constructed with only one blade, and they require more effort in the legs to get them moving. Split fins require less effort and are designed to propel you further than paddle fins. Many divers prefer split fins for this reason. If you do opt for paddle fins, look for a pair that is flexible, as this will reduce stress on the leg. The size of your scuba fins is another important thing to take into consideration. Of course, the foot needs to fit comfortably, but the length and size of the full fin is also an important thing to think about. Large fins can be quite powerful, but they can also be very inconvenient to travel with. If you’re always on the go, it can be helpful to look for fins that are small and easy to carry. Comfort is key when you’re underwater, particularly on long dives. You want a scuba fin that is going to conform to your foot and give it the support it needs. It also helps to look for a set of scuba fins with a soft interior foot pocket to prevent irritation, particularly if you’re wearing a full foot fin without socks. It should stay in place with secure buckles or straps. Many scuba fins also have ribbing on the inside, which gives them an extra bit of grip. However, you want to make sure the fins don’t rub against your feet, as this can result in blisters. If you get a chance to try the fins on in person before making a purchase, you should, because this can help you get a better idea of what the fin is going to feel like in the water. The material your scuba fins are made of is another factor to consider when doing your shopping. You want to make sure your fins are durable enough to handle even the toughest underwater conditions. Ideally, the material should be very light, so it won’t weigh you down while you’re in the water. Molded rubber is a very common material for scuba fins, because it’s compact and gives you power without weighing you down. Technopolymer and thermoplastic are also quite common. Another benefit of using scuba fins that are lightweight is that they will float if they do happen to come off while you are using them. Whether you’re preparing for a dive or coming off of a long one, you don’t want to spend too much time fussing with your fins to get them on and off. While it’s important for your fins to be secure on your foot, cumbersome buckles and straps can make them quite difficult to put on. Look for secure quick release buckles that you can get off in one touch, so you don’t have to spend too much time waddling on the beach. Some fins even offer bungee straps, which are stretchy cords that allow you to get in and out without any fussing. Scuba fins are available in many different colors, and there are both practical and stylistic considerations to make when doing your shopping. If you wear your fins often, you’ll want to buy a color that you like and that reflects your style. If you usually dive in shallow water, or you are a diving instructor or guide, you’ll want a bright color that makes it easy for others to spot you. Neons like yellow, green, or pink are great for these situations. If you’re a deep sea diver who often encounters sharks, you may want to opt for a darker color, like black, navy, or red. This makes it harder for sharks to see you. A good pair of scuba fins is essential for any diving enthusiast, whether you’re just getting started or have been a diver for years. A good pair of scuba fins can make the difference between a successful and unsuccessful dive. Ideally, your scuba fins should be incredibly comfortable, and they should also give you extra power in the water, propelling you forward and minimizing drag. Use our guide to find the best scuba fins for your needs. Choosing scuba diving fins can be a difficult task because you will want a comfortable pair but also require them to perform well underwater. Many are either comfortable or designed for performance but all of our recommendations provide the best of both worlds. They are also suited to a range of budgets because not everyone will want to spend hundreds on their first pair of scuba fins.